Take Route 2 into Norwich. As you approach the end of the highway, bear right onto Rt 2/32 (a hospital is on the right). Proceed straight to the second traffic light, and the road will V (a Greek Church will be on the left). Go to the left at the V, and very quickly the road will V again—stay to the left (the high school is on the left). Go straight through the stop sign to the end of the street (Broad St). Turn left to Broad St, and go through the first traffic light. The road will wind on to the second light (Boswell St). Turn left onto Boswell and follow to stop sign (Hickory St). Turn right onto Hickory and follow down the hill (you will see the gold dome of St Nicholas). Take the first right (Golden St) and then a quick left onto Convent St. St Nicholas is on the left, park in the lot beyond the church. Take Route 95 coming from either direction until you reach Rt 395 north. Follow Rt 395 to exit 80 East (Rt 82). As you come off the exit ramp follow Rt 82 past all the fast food and strip malls. You will eventually see the old center of the city. As you come down the “hill” you will see the waterfront, stay to the right. Follow signs for Rt 2 east. This will take you through the city. Watch for signs for Rt 12 north. As Rt 2 goes off to the right, follow Rt 12 north. This road goes straight. As it widens out, watch for a Mercury car dealer. This road will V. Rt 12 goes to the right, but stay to the left. At the top of the hill there is a large Catholic Church. Make a left onto Convent Ave. Our Church is next to the Catholic Church. If you miss the left, simply take the next left and drive thru the parking lot. 6:00 PM Great Vespers followed by Absolution and Confessions (4:00 PM from mid-October through Mid-March). 8:40 AM Third and Sixth Hours; 9:00 AM Divine Liturgy followed by fellowship in the church hall. 6:00 PM Great Vespers with Litiya. 8:40 AM Third and Sixth Hours; 9:00 AM Divine Liturgy. 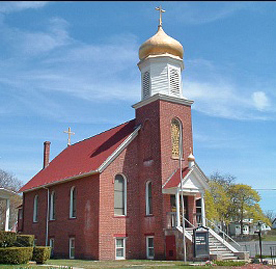 St. Nicholas Orthodox Church is a parish of the Diocese of New England within the Orthodox Church in America, which is headed by His Beatitude Metropolitan HERMAN. As a diocesan parish, we are under a Diocesan Hierarch or Bishop ÃÂ± His Grace Bishop NIKON. We are an Orthodox parish with a Russian heritage and open to all people of faith. St. Nicholas is a small but growing parish community with 58 faithful parishioners who support the church and its growth in many ways ÃÂ± stewardship, prayer, time, talents, financially. It is through their faithfulness, love and dedication that the parish of St. Nicholas not only continues to grow but also continues to provide a spiritual home for those who want to grow in faith and in love. To better understand the foundation and history of the local St Nicholas Church in Norwich, a brief look at the development and expansion of Orthodoxy in America is necessary. In the late 1800’s the North American Mission Diocese of New York was the center of Orthodoxy along the east coast. From there expansion moved eastward and northward. This direction was natural since immigrants having first arrived in New York would then seek work in the industrial centers closest to New York City. Thus, it was Bridgeport, the city closest to New York that had the first established parish in Connecticut in 1894. Other parishes were organized in Ansonia (1895) and New Britain (1902). The Reverend Constantine Buketoff was instrumental in setting up no less than six parishes during his term as pastor in New Britain and Hartford. He nurtured the initial contracts into the eventual organization of parishes in Terryville (1908), Meriden (1911), Hartford (1914), Norwich (1915), Willimantic (1916), and Springfield, Mass. (1916). In the formation of the Norwich Church a key factor was the Russian Brotherhood. In 1909 an initial group germinated the formation of a brotherhood in the city of Norwich. It brought together a larger group of people, elected officers, established dues, raised funds and assisted Russian families in times of need. The St. Nicholas Russian Brotherhood, then, became the organizational base for the eventual establishment of an Orthodox Church in Norwich. The dream for an Orthodox Church in Norwich was fulfilled in March 1914, when a delegation of Russian Orthodox men presented Archbishop Platon with a request for a priest. They offered a salary of $40 per month with an apartment and heat. Hieromonk Paul Chubaroff received the assignment from Archbishop Platon to be the first priest in Norwich arriving on March 18, 1914. Funds were raised by monthly dues set at $0.50, services were held in a hall, and the priest lived in a rented apartment. A Building Fund Drive was soon initiated for a new church building; families were requested to offer $25, single men $12.50 and single women $5. Church officers at that time were Alexander Zizik, Michael Bulka, and Alexander Shakun. The first Annual Meeting of St. Nicholas Church was held on January 4, 1915. Plans for the building of a new church moved rapidly after the purchase of two parcels of land from the Shetuchet Company on November 3, 1914 at a cost of $1200. A request for hierarchical blessings to begin constructing a church building was sent to Bishop Alexander on March 30, 1915. At the parish meeting of April 15, 1915, it was decided unanimously to build a brick church without employing a contractor. Fr. Nestor Nikolenko was given full responsibility for the construction of the new church and according to the plans made by him. Where possible, parishioners were employed in the construction of the church. Funds were obtained through loans from the parishioners and without interest. It was decided that loans would be repaid first to those needing it most. During the year 1915 a total of $4170 was collected in loans and offerings. To cover the total cost of $6618.49 for building the church an additional $2500 was borrowed from the Norwich Savings Society. A bright day in the history of the parish was November 25, 1915 when the church building of much sacrifice and love was blessed by Archbishop Evdokim and dedicated to honor its patron Saint Nicholas. A dream having been realized was no reason to stop thinking about the future, for more progress was to come. The purchase of a cemetery was next. In May of 1917 the sum of $417 was collected from parishioners and property for the St. Nicholas Cemetery was purchased on the West side of the city. The total cost of the purchase was $650. A permanent residence for the pastor and his family was next on the agenda. The Reverend Michael Yakubovsky who came to Norwich in May 1917 was followed by the Reverend Averky Bondarchuk who arrived in Norwich in December 1918. The decision to build a rectory on the lot adjoining the Church was made on June 3, 1921. The rectory was built in a similar manner as the Church, that is without a contractor. Fr. Bodnarchuk supervised the construction of the St. Nicholas Rectory. Construction began in July 1921, cost a total of $5232.07 and was completed in December 1921. Many senior parishioners still remember donating their labor for this project. The total Church debt recorded at a July 1922 meeting was $6131, a lot of money in those days! From that time forward, the parish of St. Nicholas has changed in many ways. The fabric of the community has changed, people have moved wither away or into the area. Through marriages, new faces and names have been added to our parish. And naturally many members have passed into the loving repose of our Lord. Physically, the church building was renovated, restored, and refurbished. Beginning in 1980, the community began to make additions to the edifice, new stained glass windows, a new baptismal font, and vestments. Beautiful new gold-leafed cupolas were added to the exterior, and in 1985, the parish members began a major refurbishing of the interior. The interior was opened; new wood trim, a vaulted ceiling, and additional updated lighting were added. A new wooden iconostasis was designed and contracted. Following the installation of the iconostasis, an artist was chosen to begin the final stage of the interior decoration of the holy space with the icons of Christ, the Most Blessed Virgin, and the saints. The church membership voted at a special parish meeting in mid 1995 to purchase an adjacent property. The single family home is now the rectory, and the former rectory is now the home to the office of our parish priest, our church school classrooms, and guest quarters. We hope that the property will further show the community our commitment to our faith, and our will to grow in the love of Christ. As Orthodox Christians, the main aspect of our life is to live and proclaim the Gospel of Our Lord God and Savior Jesus Christ. For by living a Christian life according to the teachings of Our Lord and by allowing Christ to be the center of our lives, we will not only continue to build up our parish of St. Nicholas but more so we will be able to bring Christ to others and thereby be witnesses to our Orthodox Faith. St. Nicholas Orthodox Church continues to grow. It continues to grow in faith and in love. It continues to live and proclaim the Gospel of Jesus Christ not only within the Norwich Area but also throughout Southeastern CT. As a growing parish within the Greenville Community, we welcome everyone to join us in prayer and in fellowship as we continue to support the growth of our Beautiful Greenville Community. May GOD continue to bless and guide all of us with many more blessed years of good health and happiness.